Automate Sales Follow-up And Closing With These Handy Hacks! It’s not hard to see why you would want to automate sales follow-up. Most B2B sales take more than a few follow-ups to close a deal. Many of those are of the “Did you get a chance to look at our product?” variety where you engage in a seemingly endless back-and-forth until you finally manage to schedule a simple call. If you ask us, that feels more like a job for a robot than a human. It’s certainly not an enjoyable part of the sales process as far as we’re concerned and we’re sure you feel the same way. But what if there was another way? What if you could simply focus all your energy on customers rather spend it on this mind-numbing work? We have the solution you’re looking for. This post is Part Three in a new Masterclass series on how to automate your sales. Sales automation will save you loads of time and let you close more deals. That’s why we created this comprehensive series, guiding you through all the different aspects of sales that can be automated and explaining how you can automate them. In this article we’ll show you how to automate sales follow-up and closing without drowning in a sea of mundane tasks. You sent a first email to a group of prospects in week one and now it’s time for you to follow up with all those prospects based on how they engaged with your message. So you start opening each email you sent one by one, checking the response and copy-pasting a follow-up email in there, personalizing the greeting for everyone. Sounds time consuming and tedious, right? That’s why you should automate outreach from the very first interaction. And not just that, you should automate sales follow-up as well! Salesflare gives you a single view of all prospects and enables you to automate your initial email. You can send the message to your whole pipeline of prospects at once using the mass email feature. All you need to do is click on a contact avatar to enter the bulk mode and hit send! Your first email – simplified! 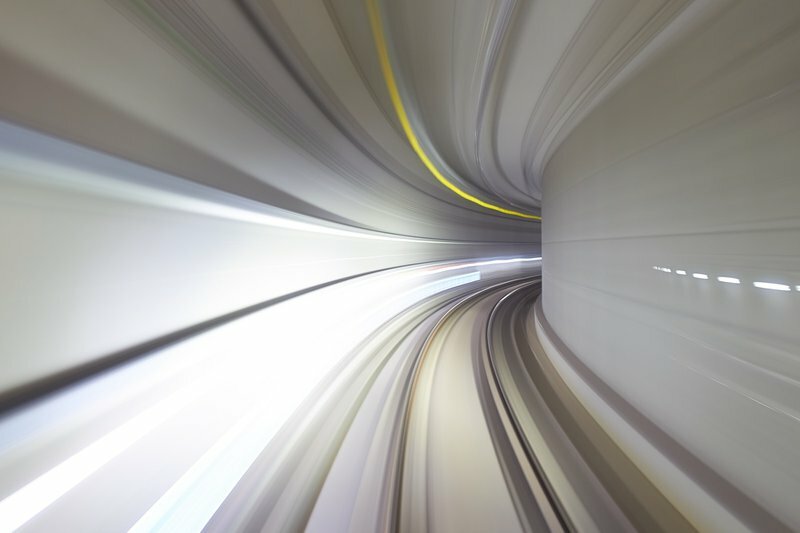 Salesflare then tracks when and how your prospects are digitally engaging with your email. Did they open the email? Did they visit your website? Which pages managed to capture their interest? The platform brings together all the invaluable tracking information onto the dashboard for each prospect. Using this data, it then highlights opportunities and proposes required action to you as real-time notifications. This makes it easy to follow up prospects in an informed and timely way. Alternatively, you can also set up triggered follow-ups. These are emails sent out automatically when the prospect fits certain criteria or reaches a certain stage in the sales cycle. For example, as soon as a prospect has clicked on a link you sent out, you can send them the next follow-up accordingly. If another has directly booked a demo with you from the first email, you can send them an automated email to schedule that demo. 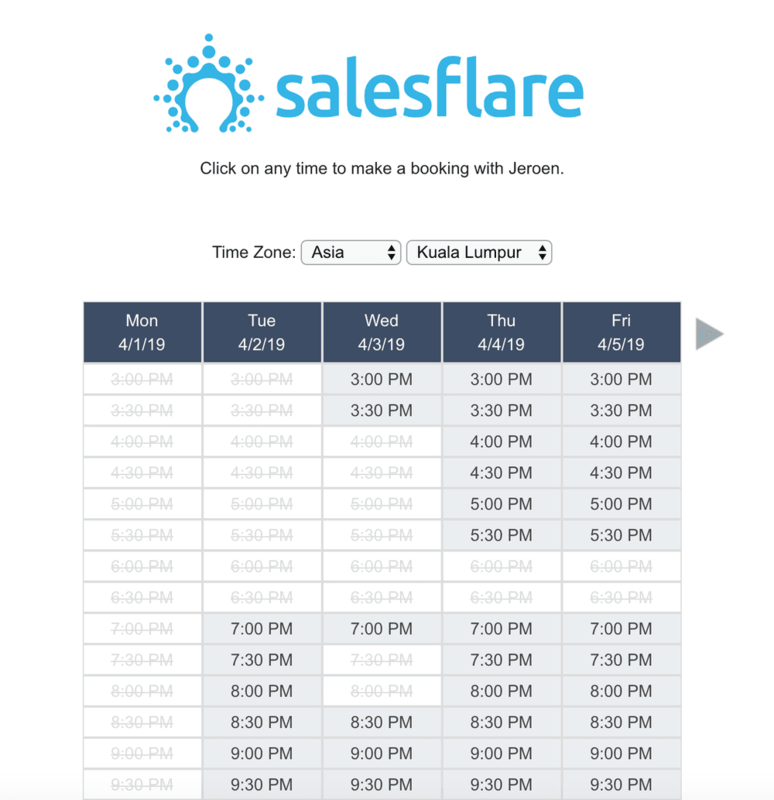 Ready to set up automated emails in Salesflare? Here’s a complete step-by-step guide. Pro tip: make sure to read The Subtle Art Of Following Up With Automation. A prospect engages with your email and is at a stage where you now need to book a meeting. Typically you’d like to give them the flexibility to choose the day and time that suit them best. So you send them an email. They reply with a few time proposals but none of their proposed time slots fit your schedule. So you shoot back another email requesting another proposal for when to meet and so on and so forth. This goes on for days. In order to avoid this, use a meeting scheduling tool like Calendly or Youcanbookme instead. Simply let the tool know your availability preferences and then share the link with the prospect on email. They can then pick a time and event that suits them as well, and it automatically gets added to your calendar. Now you can fix a sales meeting in just a few clicks. After conducting a successful sales meeting, you naturally want to send a proposal. So you quickly attach a PDF and send it to your prospect. If this is a prospect who is usually on-the-go or they keep a really busy schedule, there’s a high chance they will look at your proposal on their phone. To read the details carefully, they’ll need to zoom in and out of the PDF. Imagine yourself in that situation. You’d probably also want to put off the task until later. And as the sender, you have no idea whether the proposal was even received, so you keep hounding your prospect for their signature. In cases like these, online proposal tools can be of great help. With smart tools like Better Proposals, you can create high-impact proposals in minutes. Simply customize a template from their marketplace or create one yourself, customized for your business. Use your company colors, add your logo, include a digital signature and you’re good to go! You can also track who reads which pages of your proposal and for how long. 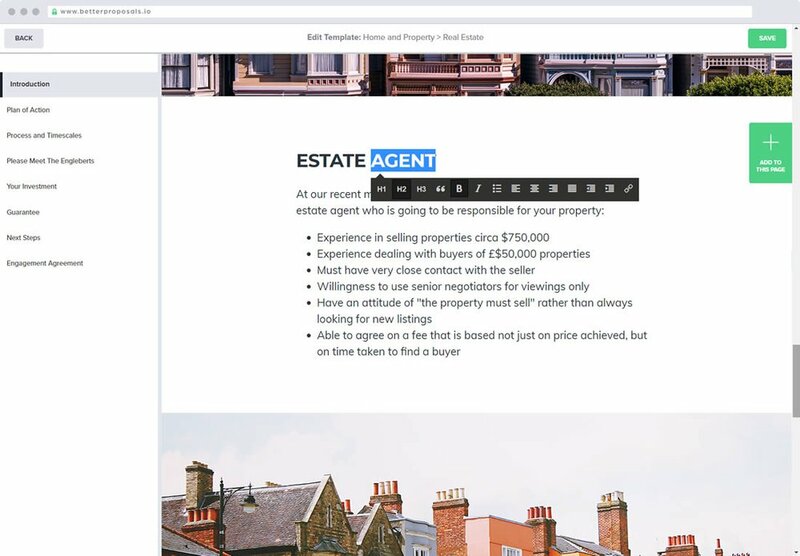 Afterwards, the recipient can sign your proposal and make a payment upfront in just a few clicks, reducing your number of needed sales follow-ups. A proposal tool often allows you to sign documents. But when you’re running a business, there are many other contracts that you need to sign or get signed. Imaging having to endlessly print these contracts, sign them, scan them and then send them by email to your would-be customers. Or even worse: sending them by traditional post. The whole process is not just annoying, it also ends up taking way too much of your time. So instead of putting yourself through this grueling process, start signing documents digitally. There are solutions like DocuSign, PandaDoc, SignNow, HelloSign and more that make this really easy. You can create a digital signature or even import your own physical signature into the program. Once set up, you can access, sign and send important documents from anywhere and everywhere. No delays! If you automate sales follow-up and closing, your successfully add time back to your day. Time you can spend trying to understand your prospects better, do more networking or even having more conversations in your target market. But most importantly, by using smart tools throughout the process, you prevent prospects from slipping through the cracks. If you follow these steps to automate sales follow-up and closing, you’ll create the freedom to focus on what really matters! Need a quick recap? Read Part Two of the Sales Automation Masterclass: How B2B Companies Can Automate Sales Outreach. Also, don’t forget to tune in next week for Part Four in our Sales Automation Masterclass: How B2B Companies Can Automate Customer Data.